A Many Splendored Thing: Love is in the Air Has Begun! Something is in the air in the major cities of Azeroth. Many guards and townsfolk spend their days giving and receiving gifts to other amorous citizens. 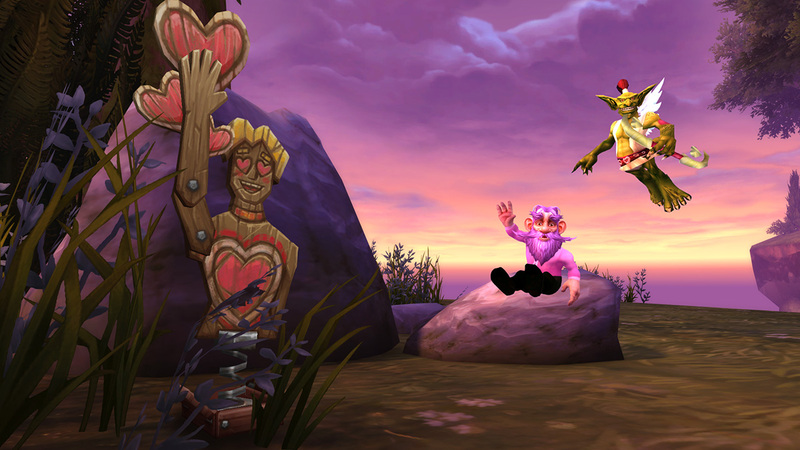 Conflict between the Horde and Alliance may be at its height, but there’s time enough for love during the Love is in the Air holiday event. Use the Group Finder (I) to participate in an encounter against Apothecary Hummel, granting a Heart-Shaped Box (which contains holiday loot) as a daily reward. This is available to characters level 20 and above. The Steamwheedle Cartel suspects there’s something shady about the goblin newcomers of the Crown Chemical Company. Investigators have been hired to get to the bottom of things—with your help. Complete special daily quests to obtain experience, gold, and Love Tokens to purchase holiday items. 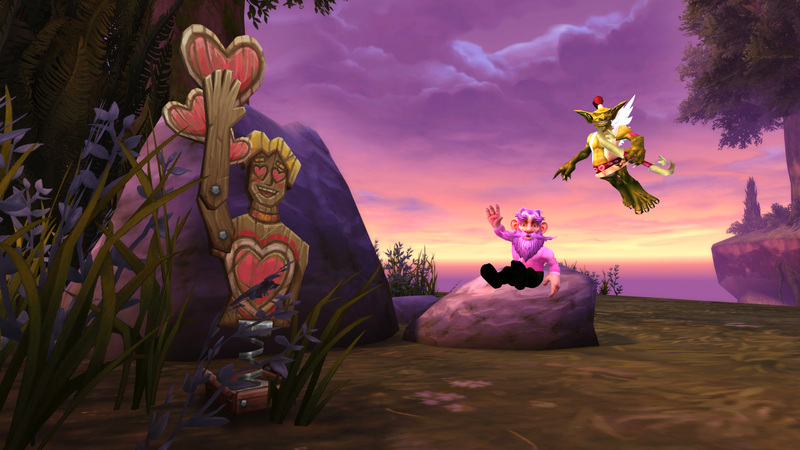 For detailed information about the quests, check out the Love Is in the Air guide on Wowhead. Eat these eight “Bag of Candies” heart candies: “Be Mine!”; “I’ll follow you all around Azeroth.”; “All yours.”; “I’m all yours!”; “Hot Lips.”; “You’re Mine!”; “You’re the best!”; and “I LOVE YOU”. Assist the Steamwheedle Cartel and stop the sinister Crown Chemical Co. plot. Use a Handful of Rose Petals on each of the race/class combinations listed: Gnome Warlock; Human Death Knight; Orc Shaman; Undead Warrior; Blood Elf Mage; Dwarf Hunter; Orc Death Knight; Night Elf Priest; Tauren Druid; Troll Rogue; and Draenei Paladin. Have a drink, put on your best perfume, throw a handful of rose petals on your would-be love, and then kiss ’em. You’ll regret it in the morning. Pity the Love Fool in these locations: Wintergrasp; Battle Ring of Gurubashi Arena; Arathi Basin Blacksmith; The Culling of Stratholme; Naxxramas. Unleash the power of love contained within a holiday necklace. Enjoy a Buttermilk Delight with someone in Dalaran at a Romantic Picnic during the Love Is in the Air celebration. Have 10 Love Rays active on you simultaneously. Obtain a Bouquet of Red or Ebon Roses during the Love Is in the Air celebration. Complete the Lovely Charm Bracelet daily quest of each Horde or Alliance capital. Obtain a permanent Peddlefeet pet by procuring a Truesilver Shafted Arrow. Shoot 10 players with the Silver Shafted Arrow. Sample the Love Is in the Air candies listed–Buttermilk Delight, Dark Desire, Sweet Surprise, Very Berry Cream. Shoot off 10 Love Rockets in 20 seconds or less. 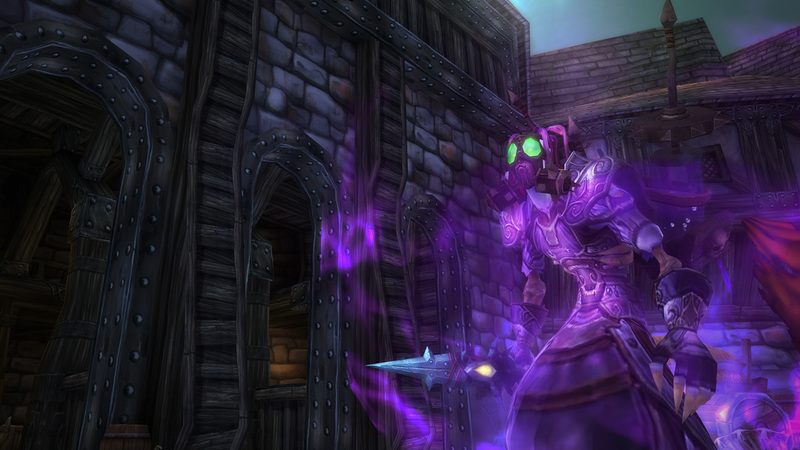 Defeat the trio of Crown Chemical Co. apothecaries in Shadowfang Keep. *These Achievements are required to earn the meta-achievement Fool for Love, which grants the Title Reward: The Love Fool. Big Love Rocket: The Heart-Shaped Box, a daily reward from the Dungeon Finder for defeating Apothecary Hummel, has a chance to drop a stylish flying mount: the Big Love Rocket! Swift Lovebird: Take to the ground atop this pink, flightless bird, sure to set the mood for any acrophobic romantic engagements. Available in exchange for Love Tokens at your faction’s Lovely Merchants, NPC vendors located in capital cities. Toxic Wasteling: This disgusting (but friendly!) ooze will grow in size as it eats critters that cross your path. Truesilver Shafted Arrow: Summon a lil’ winged goblin of love by spending Love Tokens at your faction’s Lovely Merchants. Lovebird Hatchling: This darling pink lovebird can be purchased from the Lovely Merchants.